Well it was fair to say I was excited to be going to the Dominican Republic for the first time but also a little bit wary as I’d never heard anything positive about it. I’d heard the usual stories, dodgy tummy, not luxurious etc. Well I have come back completely blown away at such a fantastic hotel and amazing hospitality both inside and outside of the resort. Eden Roc is located on the Cap Cana estate which is private gated community with its own equestrian centre, marina, zip wiring and soon to be waterpark. It also houses private luxury homes mainly for European and American clients. I stayed in a Luxury Pool Junior Suite which was very private as my pool was located with adjoining fields so nothing overlooked my room. The room itself was VERY spacious with a great bathroom giving a bath big enough for a rugby team as well as separate indoor and outdoor shower. I also stayed in a Beach Suite which was huge in size, very stylishly cool in design and located on the ground floor - literally steps from the terrace to the sea. The 1 Bedroom Suites have a King Bed with full bathroom with separate shower and bath. The living area is huge with wrap-around sofas and a fullyequipped kitchen and dining area with table. Again these are great for couples or families. The hotel is part of Relais and Chateaux and this really shines through when it comes to dining. We ate in 3 restaurants and every restaurant is very unique ranging from Fine dining, Local special dishes, Pizza and Sushi!! If you are looking for good food then this really is the place. They have it down to a fine art. They brought a chef in from Napoli, Italy just to make Pizzas nothing else just pizzas!! This shows how passionate they are when it comes to Food & Beverage. The service was phenomenal at all of the restaurants. After the first day they would recite all of our preferences for drinks at breakfast and ask if we wanted the same again!! As all the restaurants offer different cuisine, guests can easily stay for 10 days without getting bored and feeling the need to leave the resort if they didn’t want to. Though I would recommend to get out and eat in local restaurants as we did as again the service and food was great in the local lobster restaurant we went to. Overall they were very proud to show off their food and rightly so though at the end of the five days I was starting to struggle to fasten my trousers!! Kids are well taken care of too with a dedicated club from 4-12years which is complimentary. Both kids clubs were great where they have 2 resident parrots and also a mini spa where kids can pay locally for treatments. They also have mini kayaks in the lagoon that they do as part of their daily activities. 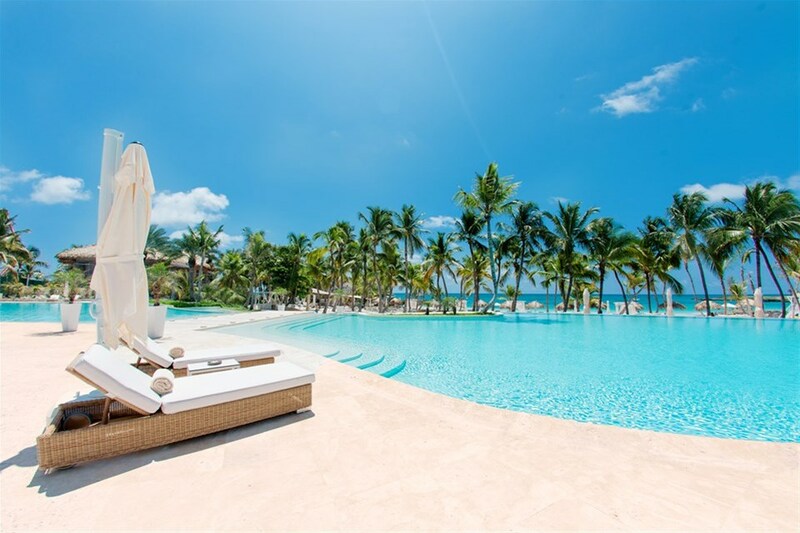 Cap Cana is great and has lots for everyone to do including couples and families alike. There is tennis, an amazing equestrian centre, a marina with restaurants and bars, Scape Park which includes zip wiring, natural lagoon cave, hiking, mountain biking, waterfalls and soon a waterpark. It is easy to get around Cap Cana as they have a set price taxi fee of US$3 per trip regardless of where you are going within Cap Cana. Taxis are more expensive when outside of Cap Cana. Overall I would not hesitate to recommend this amazing hotel and even better British Airways flies direct to Punta Cana.